What a joy it is to find a planar headphone that really nails my own set of personal preferences in terms of the music I grew up, music with fond memories. It is hard to be clinical and non-preference based when describing what the D8000 is capable off because you can easily get sucked right in. I guess that is a good thing. This is a headphone with power. A headphone with a gutsy almost visceral low-end response that delivers a fantastic yet never overcooked bass fundamental to really drive hard rock and metal with enjoyable authority. I loved listening to this headphone so much that at times I had to check myself to remember to study what it was doing also for this review. On a technical level, it is not up there with the Susvara. It is too intimate perhaps, slower and less precise with a midrange more characteristic of an Audeze creation. And yet, where Audeze have pulled back, Final have doubled-down and endowed the D8000 with plenty of exciting planar bass that I miss on their flagship LCD-4. The timbre is more warm to natural sounding than analytical and more forward than neutral. This is not a reference planar sound in the traditional sense. Final has always tuned their headphones to be less reference and more fun but on that score. However, I would have to say that the D8000 is a little more balanced than their previous stuff and certainly their most mature tuning to date. The D8000 excels at depth and reasonably good at width. It trails a little in terms of height to the class leaders such as the HE1000 V2 and the Susvara but edges out the LCD-4 in terms of upper-treble sparkle and presence. The D8000’s staging is more intimate compared to the latest Hifiman summit-fi headphones with a staging equivalent to a live performance in a large dance hall rather than an arena like atmosphere. That is not to say it isn’t spacious sounding. It does rather well with instrumental separation and there is nothing muddy about its presentation within the space afforded. Rather it simply pulls you into the performance itself than keep you at an ‘observational’ distance. The D8000 low-end is quite unlike most summit-fi planar headphones I am used to hearing. It is not razor flat, nor does it have the same amount of sub-bass roll off like the Ether and LCD-4. This is an elevated bass signature from 50Hz right up to 200Hz carrying with it both warmth and power. There is just enough roll-off from 50Hz down to 20Hz to prevent it from becoming “all about the bass” so it remains strong but not booming to the point where nothing else shines through. There is plenty of texture and details and the layering is very nicely balanced also. Not too much “thud and boom” nor does it sound one-dimensional either. There is a slight wetness to the low-end so it is not quite as quick paced or as well defined as the TOTL Susvara. What it does tremendously well, however, is to provide an excellent bass fundamental for lower-pitched instrumental notes. Guitar and kick-drum work have a striking level of weight without sounding annoyingly warm or bloated. Bass to mids transition is very smooth and coherent on the D8000. There is a slight drop around 400-500Hz but otherwise, up to 1k, there is not a lot of deviation from an otherwise fairly linear response. At most, there is around 1-2dB in elevation just for some additional and welcome vocal presence. The D8000 does dip substantially around 2-4k which is similar to how Audeze and to some extent MrSpeakers like to tune their LCD and Ether ranges. Compared to the likes of the HE1000 V2 it is going to sound a little muted and darker sounding in this region but it will also come across as the smoother of the two for higher pitched vocals and some percussion pitching. It also dips a little less than the LCD-4’s 2-4k region which tends to leave me a little less ‘engaged’ with its vocal performance. The timbre is very much on the natural to slightly warm side but again, not overly warmed up. There is a richness and slightly euphonic flavor to its instrumental tone with that underlying strong bass fundamental. Second order harmonic presence isn’t overly dominant due to the D8000’s boosted upper treble throwing down some welcome odd-harmonic overtones. Much like the LCD-4 the D8000 dips in the upper mids to 4k then starts rising again into the lower treble but stops short of that 6-7k peak the LCD-4 has. In fact, if anything, the D8000 dips a bit at 6-7k and instead peaks at 8-10k. This infuses percussion and higher pitched instrumental with a slightly softer smoother treble attack than the Audeze but also delivers a bit more upper treble energy and air. I do not think it extends as far or has as much presence as the HE1000 V2 but it is the less fatiguing of the two for sure. Sibilance is hard to come by on the D8000 unless you tip the balance with a bright sounding DAC and amp. The Final D8000 is rated at 60Ω with a sensitivity spec of 98dB. Out of the 3 competing planars we tested it was by the far the easiest of the bunch to drive. This included the LCD-4, Ether and HE1000 V2 from Hifiman. 98dB for a full-size planar headphone is actually a pretty good sensitivity rating and whilst I think a solid SET desktop amp such as the Auris HA-2 SE is ideal it can pair pretty well with a powerful DAP such as the Cayin N8. I would emphasize at this point that I did not enjoy the D8000 as much with bright setups and that included any DAC you throw in there that may affect the final sound signature of desktop amps. The treble on the D8000 seems to be very finely tuned so any source or amp that is too hot or bright tends to upset the balance a little. For example, the Xi Audio Formula S Class A flagship solid state amp sounded magical with the Qutest DAC behind it and paired with the D8000. The dynamic range and precision was a perfect blend with the D8000’s power and organic timbre. However, with the Sonica DAC instead of the Qutest, I felt the setup got a little annoyingly bright with a harder sounding treble. Not by a huge amount but if you are used to Qutest you will notice the difference. It just comes across as a little digital sounding with too much odd-harmonic presence. For me, the D8000 is most at home with a very transparent DAC and a quality SET tube amp setup. The treble balance on the D8000 is just right with amps such as the Studio 6 from ALO Audio and the Auris HA-2SE which deliver that wetter fuller sound I tend to go after. It will sound a little more laid back than solid state competitors such as the Formula S and Cayin’s much cheaper but excellent sounding iHA-6. However, in return, you get a far more organic and an almost analog type sound that I think better suits the D8000 weightier tonal characteristics. Can we count the N8 as a tube source or amp? I guess so with that Korg NuTube design on its single-ended output. This was a fabulous pairing with the D800. There is a heavy emphasis on a rich sounding and very musical presentation. This is a full-bodied performance without a hint of edginess. I really enjoyed the heck out of this setup, (audiophile technical term). Particularly so with mezzo thicker female vocal timbre such as Dua Lipa which the D8000 presented without a hint of sibilance or edginess. Even if the N8 does not have quite the dynamic range of full-size powered desktop SET amps I could use the N8 heavily and not feel I am missing too much. Off all the possible head to head it is the LCD-4 that most closely matches the D8000 in terms of pricing, size, weight and perhaps even aspects of the tuning. The build on both is quite different in terms of aesthetics. The LCD-4 has a more boutique feel with the attractive wood grains and chrome metal front grills as well as the carbon fiber headband system. The D8000 is more understated with its mix of black plastics, aluminum alloys, and leather headband. The LCD-4 weighs in at just 25g more than the D8000 though I find the LCD-4 a little better in terms of weight and pressure distribution on my head. Of course, this is anecdotal since heads are all different in size but the shorter LCD-4 headband and greater surface contact area just feels more steady. 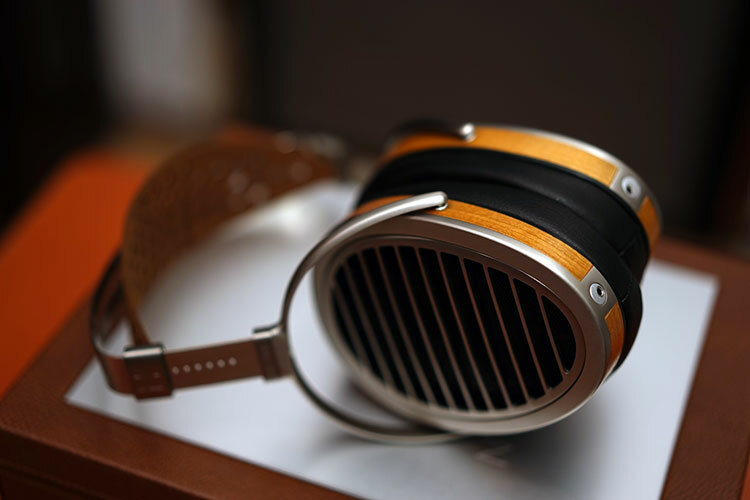 The LCD-4 uses thicker sealed leather pads compared to the D8000’s memory foam and fabric cover. Both are fine in their own unique way with the D8000 pads possibly edging it due to them being more breathable and less sweaty for longer listening sessions. 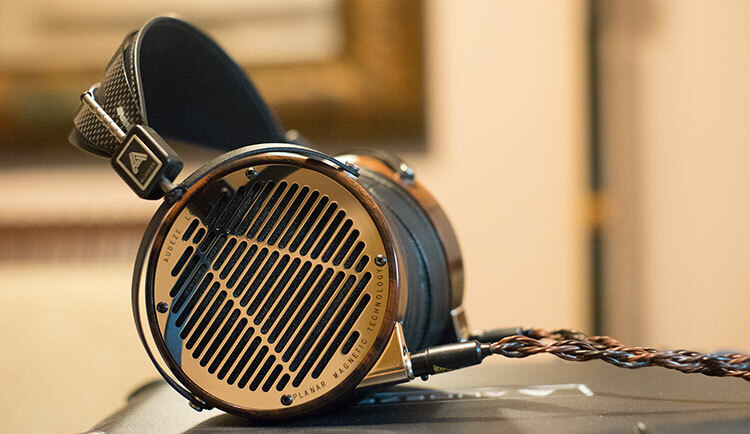 The LCD-4 has its own unique Fazor technology that Audeze deploy across a broad range of their LCD line (apart from the LCD-2 classic). The Double Fluxor™ magnet array is designed to double the driving force combined with a nano-scale diaphragm that is supposed to be lighter than the air it displaces. Thus, Audeze uses the air itself to help buffer the diaphragm whereas Final use the AFDS system to buffer the diaphragm directly. Other differences include a larger moving part diaphragm compared to the D8000, a more demanding spec of 200Ω compared to 60Ω for the D8000 and the ability to go balanced and not just single-ended in terms of cable connections. On a macro-level, I got an initial impression both the D8000 and LCD-4 were aiming for similar listening preferences with a low-to-midrange bias. However, after a few hours comparing both started to show distinct differences, most notably on the low-end. The LCD-4 is distinctly more neutral, perhaps even rolled-off in comparison to the weightier sub-to-mid bass response of the D8000. It carries less authority on the low-end and instead only starts to elevate once you start creeping into the lower-mids. 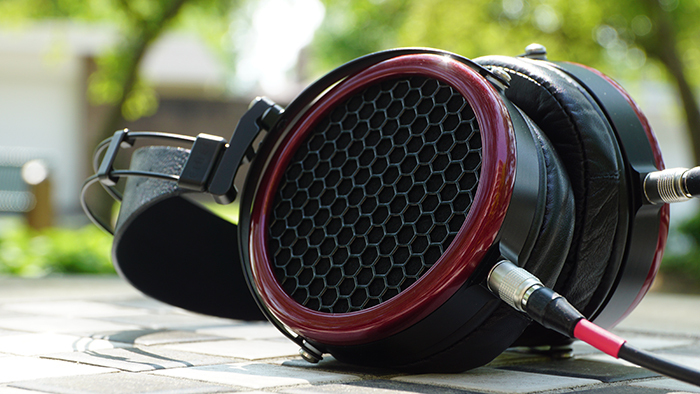 The majority of the LCD-4 presence is around the 300Hz to the 1k range. Instrumental work, particularly guitar and lower-pitched string work will be the fore. They also carry a bit of warmth and a natural sounding timbre with a slightly north of neutral level of body. The D8000’s mids from 500Hz to 1-2K are shaped in a very similar fashion with a slightly elevated and forward tuning. However, the timbre and impact is warmer and denser with that stronger sub-to-mid-bass presence and generally more aggressive response. If you are after a stronger bass fundamental and a greater sense of depth and power then the D8000 will outmaneuver the LCD-4 on that account. Both have that 2-4k dip that tends to rob percussion of a little presence in favor of vocals. Mind you, despite the D8000 sounding the more intimate the LCD-4, might just have a bit more clarity and space for the vocals compared to the warmer timbre of the D8000’s male vocal performance. The D8000 has a bit more treble presence but I find the treble tuning to sound a bit more even than the LCD-4’s top-end performance. The LCD-4 rises from 4-7k where it peaks then starts to fall away with a gentle nudge just pat 10k. The D8000 rises also from 4k but dips at 6-7k and instead peaks at 8-10k. You get a bit more sparkle and perceptible upper treble presence with the D8000 which infuses higher pitched percussion with a bit more energy and snap than the LCD-4. Overall, despite the LCD-4 edging it in terms of mid-range vocal clarity I much prefer the D8000’s ballsier and more engaging presentation. That additional power and depth makes it better for hard rock, EDM, pop and generally just about anything that sounds at their best with a strong bass fundamental. The LCD-4 still has a nice timbre and tone but that neutral low-end robs it of a bit of authority leaving the presentation perhaps too neutral and the listener somewhat disengaged. The V2 looks entirely different to the D8000. By far, the D8000 has the better build quality though the HE1000 V2 looks the flashier of the two. The light wood veneer and big open grills of the V2 will attract the eye far faster but on closer inspection, the rock-solid build quality fo the D8000 inspires much great confidence. One huge advantage the HE1000 V2 has is the weigh and comfort levels. The V2 weighs in at just 420g compared to 523g and has a much better fit overall. There is far less downwards pressure and more headband contact area on the top of my head. The lighter load makes for a very comfortable experience. You will feel a big difference between these two after an hour or so using them. 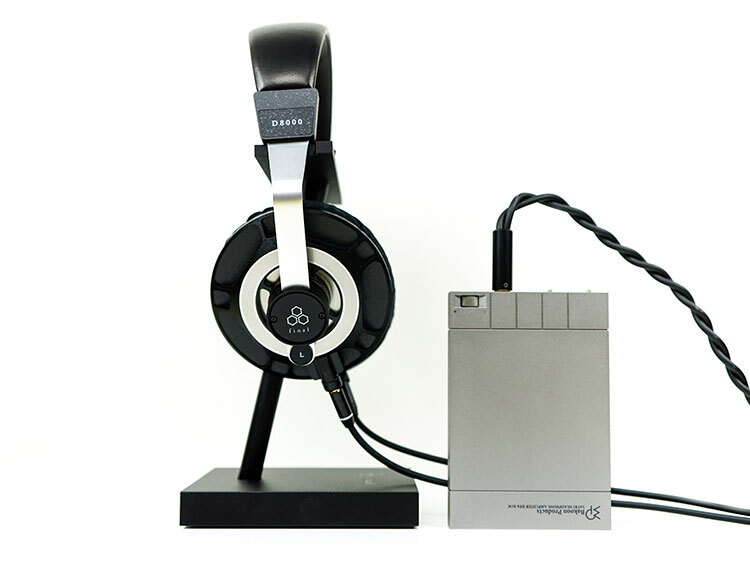 Hifiman also uses a nano-tech designed ultra-thin diaphragm combined with a dual-sided asymmetrical magnet and window shade design for their driver system. Again, the driver is somewhat larger in size at 65 x 100 mm compared to the 50mm driver inside the D8000. You would also classify the HE1000 V2 as a little more open-back in cup design than the D8000. In terms of driving ability, the HE1000 V2 is quite competitive. It actually has a lower impedance rating at 35Ω compared to the D8000’s 60Ω rating. However, the HE1000 V2 is not as sensitive at 90dB compared to the D8000’s 98dB rating. It will need more volume and from our experience good amp matching, possibly more so than the D8000. 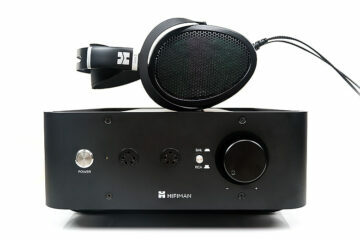 The HE1000 V2 is the more demanding of the two headphones in terms of amp matching and volume requirements. I tend to find a good tube amp such as the Auris HA-2SE set to 100Ω to match both the power and tonal characteristics of the HE1000 V2 the best. DAPs such as the recently released Cayin N8 also sounds very good with the HE1000 V2 (and the D8000 for that matter) though a solid SET of Class A amp will get the most out of the Hifiman. Comparatively speaking the HE1000 V2 is a ‘lighter touch” in terms of low-end physicality, sub-bass quantity, and general note body. The D8000 is the warmer, denser and more aggressive sounding of the two whereas the HE1000 V2 shoots more for a wider, airier sound, a slightly quicker pace, and more top-end presence. The D8000 has a more intimate soundstage, more of a live concert dance hall feel compared to an arena-like ambiance of the HE1K V2. You get a better sense of space and instrumental separation with the HE1000 V2. However, the timbre is a bit leaner with a bit more odd-harmonic emphasis with that livelier 6-7k treble boost. Percussion work on the HE1k V2 will sound the brighter and harder-edged of the two headphones as a result. The D8000 had the more natural tone and weight with a slightly richer instrumental timbre which makes all the difference to me for heavy guitar and drum work. It actually dips a bit from 6-7k and places more emphasis on 8-10k which tends to soften some of the percussion harmonics marginally more than the HE1K V2. I would revert to the HE1000 V2 if you wanted a bit something a bit cleaner, more open and spacious sounding. It has just as much depth as the D8000 and the sub-bass definition is excellent but not quite the physicality and power of the D8000. 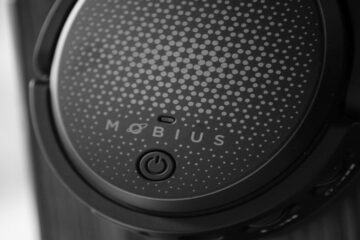 This is a grander but more ethereal sounding quicker paced planar headphone that will work well with classical, acoustics and music that requires a large soundstage. The D8000 is at its best when things get a bit grungier, more in your face and rowdy on the dance floor. This is not the Flow edition, we did not actually opt to retain the Flow edition because I have a personal preference for the original Ether Open without Flow. If you move quick enough you can grab a refurbished one for $999 from MrSpeakers main website which I think is a bargain these days. They do have the Ether 2 just announced which we hope to review in due course. Straight up the Ether is more comfortable than the D8000 for a few reasons. The Ether is much lighter at 380g compared to the 523g of the D8000. The Nitinol and leather headband system is very comfortable with excellent weight distribution compared to the more uneven D8000 experience. Like the LCD-4, the Ether uses thicker sealing leather pads and they may get a bit hotter over a while compared to the foam of the D8000. MrSpeakers use the V-Planar tech for their driver design. This is a variation of an existing planar manufacturing technique known as knurling. The whole focus of this technique is to vastly reduce the possibility of non-linear planar motion which can result in artifacts in audio reproduction from planar cans. They do this by producing a concertina effect which folds the diaphragm before general use in order to strengthen the physical structure of the diaphragm during rapid tensioning effects when sound is reproduced via a source or amp. The Ether’s specs rating is pretty close to the D8000 in terms of sensitivity at 96dB compared to 98dB with a lighter resistance load of 23Ω compared to 60Ω. Both should perform at similar levels on similar amp setups. The Ether is a mix of tones for me. It has that warmish rising mid-bass bloom with some warmth creeping into its lower mids adding some richness to its lower-pitched timbre. From 1k onwards the Ether is very even in its response and hardly a peak or tough anywhere up to 10 save one dip around 8-9k. With nothing overemphasized I would classify the Ether performance from 1k onwards as very balanced sounding. That being said the treble can be a little thin and ethereal in comparison to the D8000’s top-end. It doesn’t have quite the same level of body as the D8000 treble. I would not classify the D8000 treble as relaxed with that 8-10k boost but it sounds the wetter and more pleasing of the two. 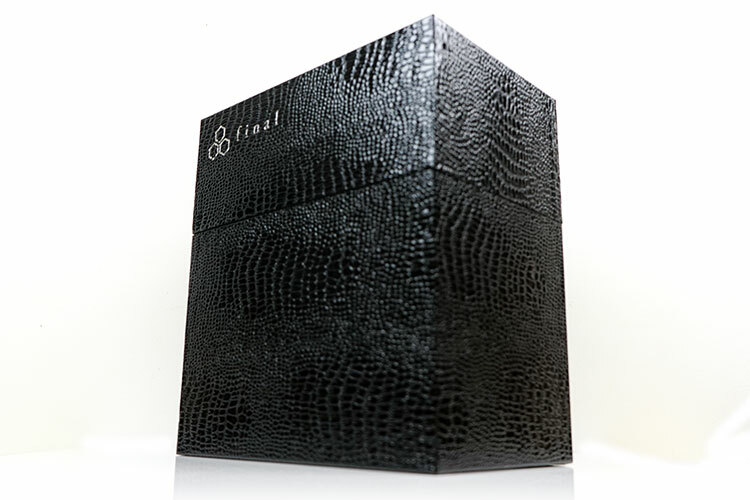 The Ether also has a level of roll-off on its sub-bass in comparison to its mid-bass to lower midrange warmth. In comparison, the D8000 is much more elevated with a stronger sub-bass almost woofer-like signature. The D8000 has the better low-end texture and detail also. Both have a bit of warmth in their instrumental timbre but the D8000 has the stronger fundamental and the better sense of depth whereas the Ether might shade it a bit for vocal presence. I tend to enjoy the Ether if I want something a bit more relaxed sounding. Both the D8000 and Ether veer to the natural to slightly warm side in terms of timbre but the Ether is not as aggressive or as weighted so it falls a bit short for me for hard rock, AOR, metal, and even EDM. I would tend to roll with the Ether on easy listening, jazz and vocal work where that nuanced slightly ethereal upper-range works a charm. The D8000 simply rocks. And I mean with just about every track or record or genre that means something to me from the vaults. Not many people know I started out in the late 80’s as a music and live act reviewer so my collection is wide and deep but it is to ‘hard rock’ and ‘new wave synth’ that I always go to first. Slap on the driving rhythms and solo guitar sounds of The Cult, Metallica, Motley Crue, and Exodus. Bring out modern day synthwave giants like Daniel Deluxe, Dan Terminus, Android 80 with their menacingly dark synth-induced beats. They sound wonderfully authoritative and bang on the money for pure musicality on the D8000. Anything that needs a solid bass fundamental and rich analog sounding texture gets plenty of that on the D8000. Watch out for the fit though. I guess nothing is perfect in this hobby of ours. If it was as light as the Ether or HE1000 V2 and the fit as comfortable, it would be a sure-fire winner. As such, small heads would do well to check out how it sits on the ‘noggin’ before buying. Otherwise, an excellent level of build quality has gone into the D8000 to match that voraciously powerful sounding presentation. Please review also the Enigma Acoustics / Lotoo Dharma D200 IEM. Hi Guy, yeah the voltage output is my preferred choice, I just like how it adds a little more body on the low-end. Current mode remains quite neutral which is not how I want to hear the D8000. Thanks Man, glad to see 80’s rock is still alive and well in 2018!